The Mob Match, the final race of the Midweek League season in Welwyn Garden City on 13th July, hosted jointly by Garden City runners and Herts Phoenix AC, will feature the end of season presentations to teams and individual runners. Congratulations to all clubs and runners who have achieved awards or promotions over the four race series, and to all runners who competed during the season and contributed to the league’s success. 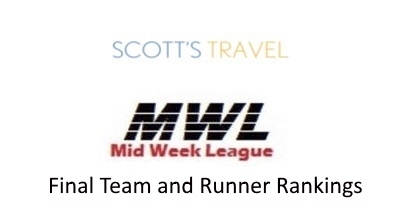 Huge thanks to Scotts Travel for again sponsoring the League this year, to Jake Amos and the organising committee, to all the clubs hosting races and to everybody who has helped in any capacity at the races this year and without whom they could not happen. Special thanks to Paul Holgate from FVS who works long into the night to produce the results of the races so quickly.